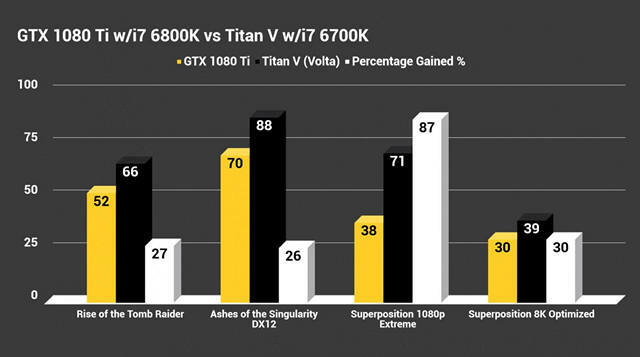 The recently-launched Titan V is by far the most powerful prosumer graphics card in the market today, but with 640 tensor cores that deliver up to 110 teraflops of power in AI calculations, it’s aimed squarely at machine learning and AI processing rather than gaming. Nvidia has been promoting its new $3,000 flagship as “the most powerful PC GPU ever created”, and while we never had any reason to doubt that assertion, we now know exactly how it matches up against the competition, thanks to a number of benchmarks posted by Redditor MrOmgWtfHaxor. 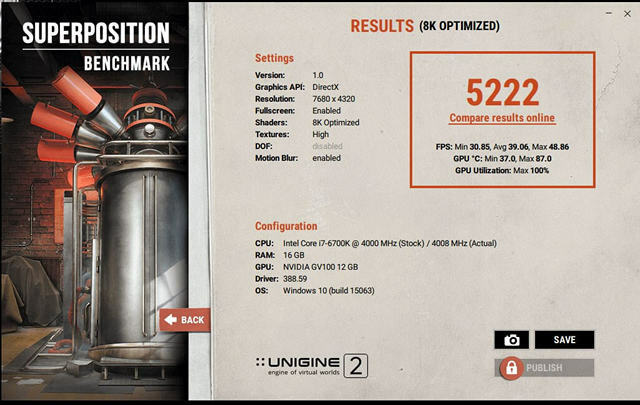 As you can see from the image above, Unigine Superposition benchmark shows the GPU scoring 5,222 in the 8K Optimized preset. The image below shows the card scoring a massive 9,431 points with the 1080p Extreme preset. 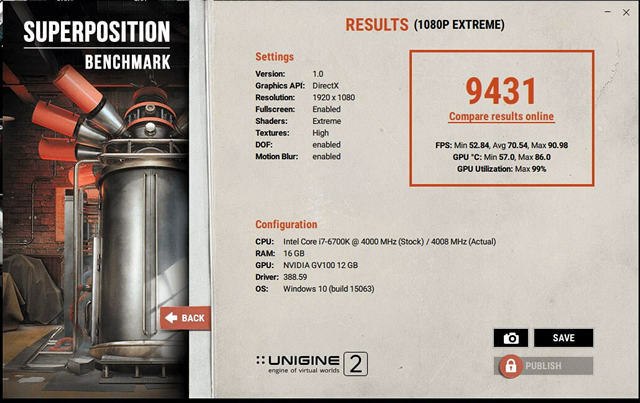 In case you’re wondering how that compares to the 1080 Ti, here’s a small insight – extreme overclocker Kingpin managed to OC a GTX 1080 Ti to an astonishing 2,581MHz on liquid nitrogen to reach a score of 8,642. Meanwhile, 3DMark Fire Strike 1.1 results show the Titan V scoring 32,774 at stock frequencies and using Nvidia’s latest 388.59 WHQL drivers. When overclocked by 170MHz, the score went up to 35,991. The Titan Xp and GTX 1080 Ti, by comparison, normally struggle to go anywhere beyond 28,000. (Update: 3D Mark Fire Strike results seem to be no longer accessible). Irrespective of whether the Titan V is aimed at gamers or not, many of you will want to know how the card fares in gaming benchmarks. So here they are, courtesy of YouTuber Joker Productions: The Titan V averaged 66fps in Rise of the Tomb Raider, 158fps in Gears of War and 88fps in Ashes of the Singularity, all on the highest settings at 1440p. In comparison, the GTX 1080 Ti only got 52fps in Tomb Raider and 70fps in Ashes of Singularity. 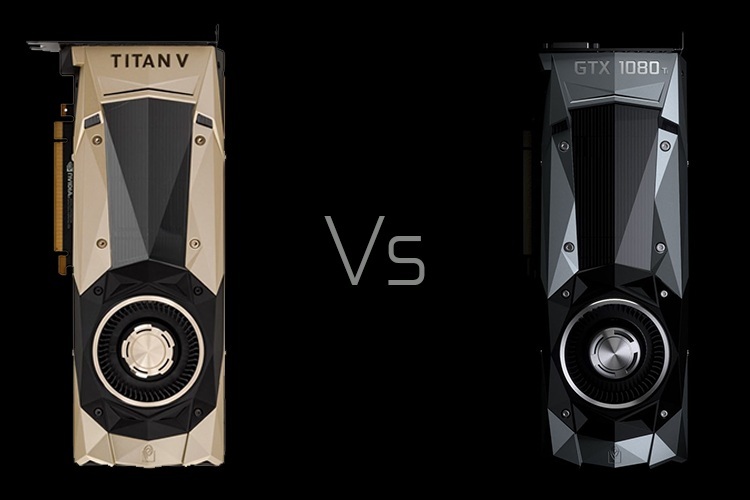 While the results do show that the Titan V is ahead of its competition, they also show that it makes zero sense to buy this for a gaming rig, as it costs about four times that of the 1080 Ti for a relatively minor performance boost. It is important to note here that the benchmarks are not officially released by Nvidia and we cannot independently verify their authenticity, so take them with a pinch of salt if you will.